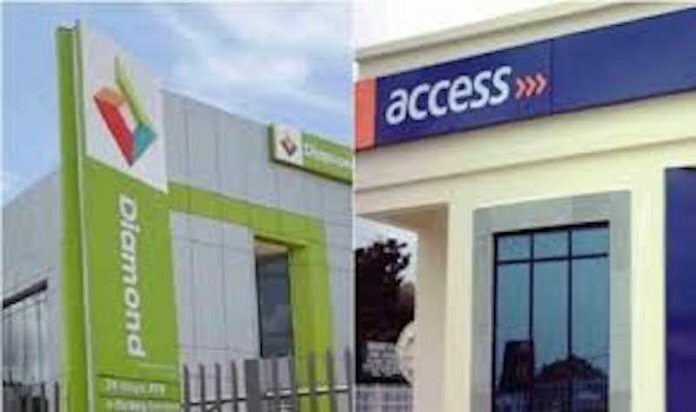 Diamond Bank and Access Bank that recently entered into a business combination deal have set aside offers to reward their loyal customers this Valentine season. According to a statement, customers would be rewarded with loyalty points, cash-back, free websites for SMEs, giveaways and lots more by simply carrying out one or more banking transactions or using the banks’ services from February 1 to February 28, 2019. According to the Head, Retail Banking, Diamond Bank, Robert Giles, “as we come together to be stronger, we are using the ‘season of love’ to show our customers that we are here for them to help achieve their goals. “We don’t take our customers trust and loyalty for granted and on this Valentine, we will really show how much we care. The bank will reward customers who subscribe to Xclusive Plus, reactivate their accounts by updating BVN, grow their balances or do more transactions on the mobile app or our USSD channel *426#. “We are also demonstrating our commitment to closing the financial inclusion gap by giving cash rewards for setting up and funding Diamond Y’ello accounts. We are giving away thousands of Gem points, so you can choose your own gift and helping small businesses set up their own website for free”. Reiterating Giles’ statement, the Executive Director, Personal Banking Access Bank, Plc, Victor Etuokwu said, “the rewards to our customers this season of love is simply our own way of saying thank you to our combined customers at Access and Diamond banks for banking with us and welcoming them to the new opportunities as we merge to serve them better. “Customers and delivering real benefits are at the heart of our decision to create one of Nigeria’s leading banks. The products and services that Diamond Bank customers enjoy, including its commitment to digital innovation, will continue unchanged and will be backed by Access Bank’s own commitment to customers, financial inclusion and sustainability, and the bank’s corporate expertise and strong balance sheet. “In the spirit of the season, we will reward every customer who spend a minimum of using their Access/Diamond cards at least 3 times a week on Access Bank and Diamond Bank POS terminals. “We will also reward the first 200 customers to perform funds transfer or bill payment on *901/ *426# daily with airtime too. Access bank savings account customers will receive free airtime when they fund their accounts and 10,000 R.E.A.L points will be awarded to 1000 new customers when they subscribe to the R.E.A.L platform”. Etuokwu concluded.